In this essay I will try to analyse the book, The People Smuggler discussing it in terms of being a narrative of an ordinary person and the circumstances of his life that led him to fight difficulties and take epic risks. On the other hand, I will shed light on the book as a study of socio-political interactions that appear directly sometimes, while at others hide between the lines. While the narrative is the main thrust of the book, the socio-political analysis it represents an implicit background that often appears on the surface, directing clear convictions towards some institutions and organisations, such as the United Nations and the Australian Federal Police. The central persona, Ali Al Jenabi, describes these organisations as complicating the refugee problem and not seeing human side of refugees. I will approach these two obvious themes in the book along with a focus on some of the narrative techniques that define the form and content of the story. Then I will conclude my reading by conducting a quick comparison between the book and other non-fiction books. If the most important writing principles of telling a story to the public are ‘Simplifying the complex, knowing your subject, using plain English, taking one step at a time, making the central point clear, explaining the unfamiliar with the familiar, and making the message accessible’ (Newsom & Haynes, 2013 p180-120), then Robin de Crespigny succeeded brilliantly in attracting her audience. She not only applied those elements but also employed them throughout the main narrative factor; suspense. From this standpoint, the book is in reality a story of an ordinary person, however, the high level of technical skill the book demonstrates in presenting the life of Ali Al Jenabi, highlighted the profound humanitarian aspects of his situation: a unique life fluctuating between hope and pain. The suspense begins from the first. 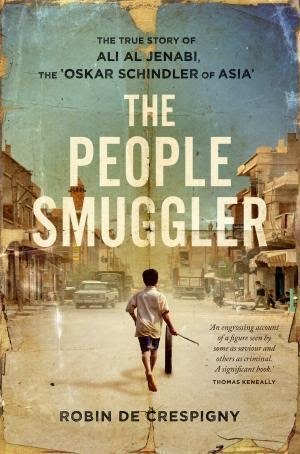 The title, ‘The True Story of Ali Al Jenabi, The ‘Oscar Schindler of Asia’, The People Smuggler’, points the reader’s attention to the smuggling, in particular, namely the issue raised at the level of public opinion. This is addressed in relation to the government in Australia. We find the narrator, which is the smuggler himself, brings the reader back to his childhood, in Baghdad in the early seventies, ‘I am the oldest son, which meant my parents gave me everything. I was lavished with attention, but that was not what inspired my affection for my father. He was a man with an indomitable spirit (de Crespigny, 2012 p3). Thus the book begins. It is most likely a disappointment for any politician, when a writer so apparently mobilises the sympathy of the reader around the smuggler. It is the central narrative task of this work; converting marginal and forgotten and distant into exactly the opposite. The principles of writing the above-mentioned subjects, is the nature of the long narrative text that takes advantage of the novel and cinematic technique. For instance, the first chapters may seem far removed from the basic principles of writing, such as ‘make the central points clear’ or ‘know your subject’, because the ‘smuggling’ subject does not appear yet, instead, the narrator is busy talking about his childhood and his family. Why should the reader read several pages about the courage of the Hassan Pilot (Ali’s father)? The answer is unfolding successively whenever events pass and the reader is spared the temporal and spatial phases with Ali Al Jenabi. On this basis, the adventure of Al Jenabi, his boldness and courage in people smuggling from Indonesia to Australia in particular, will be fully understood. The reader in turn has become informed enough about the history of the characters, the times and places. ‘Yes, it’s easy to run’ (de Crespigny, 2012, p 203). In short, it is the desperate desire to cling to life with the exception of the family that others had already escaped from the hands of the police. In this context, there are those who were inspired by the courage and the qualities of Ali Al Jenabi had greater consideration for him: ‘His bravery, endurance, commitment and sheer entrepreneurial skills are just what Australia needs, but in Indonesia they were also just what his fellow Iraqis fleeing the horrors of Saddam needed (Haines, 2012).’ The irony should be noted here, that this courage stems largely from a position of weakness. People fleeing from one country to another and another and so on to become refugees and settle eventually in Australia. During the horrors of this journey, courage and risk are the transit key. Maybe that is why, The People Smuggler has received a strong echo and sympathy with Ali Al Jenabi and the likes, who are looking for a life free from fear and danger. According to the nature of the political reaction from the Australian government especially, critical attack was not limited to Ali Al Jenabi alone, but there were many who stood on his side criticising the attitudes of successive Australian governments and the issue of refugees in general. Bruce Douglas Haigh, the Australian political commentator and former diplomat says, ‘Weak people make tough decisions, usually to protect themselves. Without fear of contradiction, none of the current political leadership has ever been faced with, or been in a position where terrified and pleading individuals sought assistance, protection and succour. They have never seen people released from prison beaten black and blue and reeking of fear. Yet they act as if they have. They crave respect; an impossibility, except from sycophants and rent seekers’ (Haigh, 2012). In fact, attention should be paid to that part of the book’s title, involving value judgments and does not assess any consideration of the political, through Ali Al Jenabi’s description. Beginning on the cover page, as an exceptional figure, he is ‘Oskar Schindler of Asia’. In other words, this is an explicit declaration by the writer that she is standing on the side of the smuggler. The similarity between the two is about rescue, where ‘Oscar Schindler rose to the highest level of humanity, walked through the bloody mud of the Holocaust without soiling his soul, his compassion, his respect for human life and gave his Jews a second chance at life. He miraculously managed to do it…’ (Bülow, 2011-13). When it comes to criticism, Ali Al Jenabi, the narrator analyses the political and human data, linking events by their context and sequence, comments on them from his point of view as a human being, subjected to arrest and imprisonment for long periods, as well as the refusal of access to permanent residency. From this perspective she spares no effort in directing sharp criticism at those factors that led to his fate. There is more than one such incident that occurs during the course of the events of Al Jenabi’s story, he mentions and scrutinizes them, such as the invasion of Iraq, Saddam Hussein’s fall, the bombing of the Twin Towers (World Trade Centre in New York. ‘It seems that the Australian Prime Minister, Mr John Howard, who was in America at the time of this disaster, is using it to further demonise asylum seekers. He appears to be trying to persuade his public, that terrorist are disguising themselves as refugees and being brought in on boats by people smugglers, and that this attack on New York somehow verifies his fear’ (de Crespigny, 2012, p 271). For Ali, ‘It is unclear why Australians are so strangely unconcerned about asylum seekers arriving by airplane; maybe because there’re no pictures in the paper or on the TV. But they are so afraid of the two percent who come by boat that they lock them up like criminals’ (de Crespigny, 2012). This is certainly the viewpoint of a people smuggler, but at the same time we never cannot ignore that it is a point of view of a human running away because they fear death and are in search of a safe haven to live with his family. Nor can we turn a blind eye that for him the smuggling of people was not the result of planning, as it was purely compelling because of the difficult circumstances he faced. From his miserable position, Ali Al Jenabi ceases his criticism of the Australian authorities, which were tracking his movements for so long through the Australian Federal Police and followed him with spies until they managed, in partnership with the Thai police, to arrest him at Bangkok airport. In a Thai prison, Ali Al Jenabi was surrounded by loneliness, obsessions and anxiety. He realised that he was no longer free. He lost his wife, his infant daughter, his family, his dreams, and became a prisoner in every sense of the word. More than that, his future was mysterious and unknown. By this time, the invasion of Iraq had taken its course. In that juncture, the prisoner was wondering and criticising the Australian Prime Minister, ‘If I got arrested because I did something wrong then John Howard should get caught too. He sent his troops into my country without UN approval. If I broke someone’s law it was for something good. I provided a path to safety for people who had few other options. Maybe Mr. Howard thought what he did was good too, but the majority of Australians and millions of people around the world didn’t think so. And who is going to take the wave of refugees the war in Iraq will create? Not Australia, according to him’ (de Crespigny, 2012, p 298). The language is smooth, intense, and chunky with emotion, carrying the climate’s features in which the events revolve according to its time and place. The rhythm of language supports the psychological conditions of the narrator, speeds up or slows down as the context requires, once locked into a lot of details, and once again shortens events and moves to others. In the chapter titled ‘Asylum’, Ali lives devastatingly waiting. Waiting for the court’s decision to approve his asylum but also he is threatened with deportation to Iraq. Time goes slowly without any reassuring news. He cannot leave, and although he was in prison and is supposed to now be in a better place, the wait fills his time with concern. He was trying to make fun of the brunt of waiting, one way or another, but there is no hope on the horizon. ‘Every time the loudspeaker begins to blast a name it goes through my body like a bullet… Two more months slip by and still nothing happens… but to no avail’ (de Crespigny, R. 2012, p 325). ‘They don’t say anything, but I see the sorrow in their eyes… I lie awake at night asking myself, Where is the end of this?’ (de Crespigny, 2012, p 326). ‘This is more terrible than jail’ (de Crespigny, 2012, p 327). ‘The months go by… There is nothing to fight against and the boredom is insufferable; they kill you not by torture or execution, but by hopelessness and despair’ (de Crespigny, 2012, p 328). The rhythm of the waiting is in line with the events, and circumstances experienced by Ali. The reader in turn waits for that decision. Psychologically and mentally the reader also becomes in waiting, but the irony is that the narrative employs language in his favour. The atmosphere is dominated by boredom. In return, the language and other elements of writing are accomplishing that through suspense. The reader wants to complete the chapter to know what will result from that long, waiting without end. This book is certainly a story of an everyday man looking for a safe place for life, but it also serves as a document of conviction against a political decision, which denied the human right to live in peace and they want to expel him, claiming that he is a people smuggler facing serious acts. For the purpose of promoting the right of Ali Al Jenabi in obtaining permanent residence with his family in Australia, the book lists the details of the smuggling operations, a collection of people, buying ships, hiring captains, the distribution of bribes to the Indonesian’s police and marines, since its early stages in Indonesia or Malaysia, until the arrival of ships to Australia. In order to achieve the maximum feasibility of the narrative, the writer used the first person where Ali Al Jenabi himself does the narrative. He comes and goes, remembering and thinking of his unhappy present and dreaming of the future and its worth of a human life. The use of the first person grants the narrator a stronger presence. Perhaps the writer realises that using the third person will restrict her, as a narrator, and expose her to criticism. In this case, the narrative will preclude her from commenting on the events freely, and critics may accuse her of not being neutral. The importance of the first person in particular lies, in the criticism, commenting and adopting attitudes. Page after page, the reader approaches Ali Al Jenabi, and sees him clearly. Thus, the narrative creates a fascinating, intimate atmosphere where the reader triumphs for this man and his ilk, and in turn criticises governments and institutions that contribute to the separation of refugee families, making their lives vulnerable due to policies, routine and painful waiting. Ali Al Jenabi says, ‘Millions of people drift into shambolic UN camps all over the world, and only about two percent are ever settled. For some it takes a few years, for others decades, with many eventually giving up on the UN and finding a smuggler to take them on a boat’ (de Crespigny, 2012, p 312). This book can be considered a novel; it discloses its content through the remarkable narrative techniques, as accurate descriptions of places and personalities and emotions, suspense, flashbacks, imagination, the multiplicity of characters and events, and the dependence of a central event linking the chapters of the book. Other narrative writing techniques, such as monologue, dialogue, cutting and completing the events, keep the reader connected with reading and positive participation by information provided by the narrator who through which paints a large, clear picture. It is a breathtaking genuine novel and does not shy from surprising the reader but, contrary to fiction, the use of the first person has enabled it to employ criticism positively in its creative framework. It is a struggler’s novel, depicting courage, despair, hope, anger and love because it is a real person’s story, the rigors of circumstances that made him a people smuggler, and undoubtedly he embodies the tragedy of his people. Ali Al Jenabi, the narrator, finally sums up the whole matter, ‘If you want to stop people smugglers you have to do something about what causes people to flee their own countries in the first place’ (de Crespigny, 2012, p 350). Although this story is true, it falls under non-fiction, the first person is used in its structure in a creative way just as it is for fiction. ‘In particular, first person fiction, in which the narrator self-narrates about his or her own experiences and perceptions, is thought to invite an especially close relationship between reader and narrative voice’ (Keen, 2006). This literally applies to the story of The People Smuggler. Though the narrative constantly surprises the reader, and to a remarkable extent benefits from the cinematic techniques, the writer succeeds in delivering the voice of Ali Al Jenabi deeply and captivating his intimacy. In fact, from the first pages the relationship between the narrator and the reader becomes strong. Credit for this goes primarily due to the first person. Robin De Crespigny is aware of the vital role of the first person. She knows exactly its strength and flowing presence in the story of Ali Al Jenabi. Likewise she announces her high appreciation for Ali Al Jenabi. In the ‘Author’s Note’ says Crespigny, ‘This is a story not so much about people smuggling, as about a man who happened to become one’ (de Crespigny, 2012, p ix). After several lines she adds, ‘I made the decision to write this book in the first person to enable the reader to experience Ali’s life at first hand by being placed in his shoes. Until Ali reached Australia he spoke Arabic, Kurdish, Farsi and Indonesian, but very little English. So the voice is essentially a construct of him and me, in the English language as he might have used it. As all the events are through his eyes, the view of those events reflect Ali’s recollections’ (de Crespigny, 2012). Talk about employing fiction techniques in this true story and mastering it in terms of outstanding novels, brings me to remembering one of the most important books in this regard. It is The Story of a Shipwrecked Sailor by the Colombian novelist Gabriel Garcia Marquez, winner of the Nobel Prize for Literature in 1982. In 1955 a Colombian navy ship sailed from Alabama towards Colombia. On board were eight sailors, but it also was loaded with smuggled goods that exceeded its absorption’s capacity, which caused its sinking and the drowning of its sailors, but one of them miraculously survived after cutting the Caribbean into a raft, for a period of 10 days. He withstood hunger, thirst and the heat of the sun, and was about to be devoured by whales. In 2008 Robin De Crespigny had begun working on her book. In this context she says: ‘Thus began an expedition of more than three years working intensively with Ali… We met every few weeks… I recorded all our conversations, then spent long hours meticulously transcribing them….’ (de Crespigny, 2012, p viii). Whereas Marquez had spent 120 hours with the only sailor who survived from the sinking. Under the title ‘The Story of this Story’ says Marquez, ‘His name was Luis Alejandro Velasco. This book is a journalistic reconstruction of what he told me, as it was published one month after the disaster in Bogota daily El Espectador… In twenty daily sessions, each lasting six hours, during which I took notes and sprang trick questions on him to expose contradictions, we put together an accurate and concise account of his ten days at sea. It was so detailed and so exciting that my only concern was finding readers who would believe it. Not solely for that reason but also because it seemed fitting, we agreed that the story would be written in the first person and signed by him’ (Garcia Marquez, 1986). Their backgrounds sparked controversy on the political and social level and drove public opinion. Both criticised, condemned and exposed one way or another, government practices in relation to the rationale, reasons and results. Both list the suffering of ordinary persons faced with difficulties and dangers in order to survive. Both are listed by the first person, where The People Smuggler, Ali Al Jenabi, tells his story, and Luis Alejandro Velasco also lists his story by himself. Needless to say, the writing process and technics are subject to the creativity of both Marquez and Crespigny. At the same time, the comparison reveals, of course, many differences between the two workers. For instance, The People Smuggler lists not only the people smuggling but also details the life of Ali Al Jenabi, from his upbringing in Iraq until his arrival in Australia. In contrast, The Story of a Shipwrecked Sailor, focuses moment by moment on the ten days that Luis Alejandro Velasco spent facing death in the midst of the horrors of the sea, whales, and thirst, and hunger, factors of horrific nature and despair. It should be noted that Crespigny also used verbs in a manner with no lesser skill than with her dealing with other writing techniques. In the first chapters Ali often uses past verbs when retelling about his childhood and Iraq at that time: ‘When I was a little older my four brothers and I would wait in the afternoon for my father’s return from his shop….’ (de Crespigny, 2012, p 4), ‘… Saddam invaded Kuwait. When the Americans drove him out, offering the Shiites support if we rose up against them, we believed them. But as soon as the uprising started, the US left us to our fate, and the full weight of Saddam’s army was turned on us’ (de Crespigny, 2012, p 23). This is understandable on the basis that it all happened in the past. Even if the present tense was used here, it is accidental, especially phrases like ‘that night’, ‘after’, ‘next’ remind the reader that the events are in the past yet its importance makes it happen now, ‘That nights are the worst. Any sound or voice I hear outside ramps up my anxiety’ (de Crespigny, 2012, p 93), ‘That night I lie in bed listening to them sleeping, and pray that something will happen before the morning to cancel my trip’ (de Crespigny, 2012, p 146). Whenever the reader continued reading, they discovered that the narrator uses present tense more than past tense, perhaps because he became confident that he had already attracted the reader’s attention. The formula of the present tense also enhances the narrative’s building, as well as opening the eyes of the reader and putting him in the heart of the event. ‘Even when writing about the past, writers may place scenes in [the] present tense, giving the reader the feeling of being an eyewitness to the action’ (Caulley, 2008). The book is divided into three parts according to the countries (Iraq, Indonesia, and Australia) and years (1970-2012). Beginning the second part sees the present tense dominate the prose, it is time to Ali to turn from a person looking for a people smuggler to a person smuggler himself. The past is over, and this is the present, the people smuggling, as the book’s title and its central issue. In this essay I analysed the principles and elements of writing used in The People Smuggler, across two key points that are the narrative and issues raised. The narrative and socio-political elements in the book work together. There is no doubt that the narrative tells the story of an ordinary person struggling to find a decent life for himself and his family, but this struggle is closely related to social and political conditions that the narrator does not hesitate to explore, analyse, criticise and condemn clearly and boldly. In order to deepen my view, I have made comparison between this book and a book that has won worldwide attention for decades. Bülow, L. (2011-13) Oscar Schindler, His List of Life, http://www.oskarschindler.com/ (accessed 7 April 2015). Caulley, D. N. (2008), ‘Making Qualitative Research Reports Less Boring, The Techniques of Writing Creative Nonfiction’. https://bblearn.griffith.edu.au/bbcswebdav/pid-1298019-dt-content-rid-3871291_1/courses/7117HUM_3151/Caulley-CNF-Tech-2008.pdf (accessed 6 April 2015). de Crespigny, R. (2012) The true story of Ali Al Jenabi, The ‘Oskar Schindler of Asia’, The People Smuggler. Penguin Books, Australia. Garcia Marquez, G. (1986) The Story of a Shipwrecked Sailor, translated by Randolph Hogan. http://www.amazon.com/Shipwrecked-Sailor-Gabriel-Garcia-Marquez/dp/067972205X (accessed 8 April 2015). Haigh, B. (2012) ABC, The Drum Home, ‘People Smuggler or the Schindler of Asia?’ http://www.abc.net.au/news/2012-05-07/haigh-people-smuggler-or-the-schindler-of-asia3f/3994310 (accessed 7 April 2015). Haines, J. (2012) Ozleft, An Independent Voice on the Left, The People Smuggler: A review, https://ozleft.wordpress.com/2012/12/29/the-people-smuggler-a-review/ (accessed 7 April 2015). Keen, S. A. (2006) Theory of Narrative Empathy, Muse Scholarly Journal Online. Volume 14, Number 3, October 2006. http://www.dlls.univr.it/documenti/Seminario/documenti/documenti336895.pdf (accessed 8 April 2015). Newsom, D., Haynes. J. (2013) Public Relations Writing, Form & Style. Boston, MA: Wadsworth Cengage Learning.